The prevalence of major depression (MD) according to population studies is the same for old (65 years and older) and younger adults. In contrast, an elevated proportion of old MD patients are hospitalized compared to younger adults with MD, indicating a need to expand the characteristics of old inpatients with MD. To illustrate this point, the association between inflammation and MD in old psychiatric inpatients is sparsely investigated even though an association between inflammation and treatment resistance among younger adults with MD has been reported. In this study, we aimed to explore the plasma concentrations of 27 immune markers in old inpatients with MD, and our purpose was to expand the understanding of inflammatory mechanisms in these patients. Prior to electroconvulsive treatment of MD, we compared 64 inpatients with unipolar MD (mean age 75.2 years) and 18 non-depressed controls (mean age 78.0 years). Symptoms characterizing MD were assessed by the Hamilton Rating Scale of Depression (HRSD)-17, and the immune markers from peripheral blood plasma were analysed using multiplex assay technology. For statistical analysis of data, we used the independent samples median test, independent samples t-test, χ2-test, receiver operating characteristic curve analyses, stepwise discriminant analysis, and multivariate linear regression. Twenty-two immune markers representing pro- and anti-inflammatory, adaptive and trophic signalling had higher concentrations in the inpatients compared to the controls. Only the four immune markers IL-1β, IL-5, IL-10 and IL-15 had concentrations below the lower detection limit in a considerable portion (above 20%) of the patient cases. 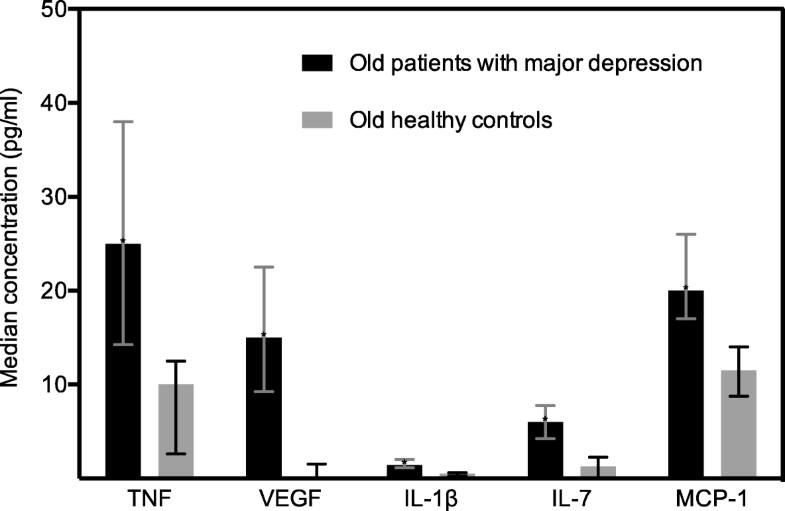 A combination of the concentration in plasma of TNF, vascular endothelial growth factor (VEGF), IL-1β, IL-7 and monocyte chemotactic protein (MCP)-1, correctly classified 98.4% of the depressed patients and 83.3% of the non-depressed controls. Plasma concentration of TNF and VEGF were associated with the HRSD-17 scores (p = 0.017 and 0.005, respectively). Our results indicate that several inflammatory mechanisms may be highly activated in old psychiatric inpatients with MD, and indicate that immune markers may contribute to a more comprehensive understanding of MD in old persons. According to population studies the prevalence of major depression (MD) in old adults (65 years and older) is reported to be about two to 5 % in the USA, Germany and Norway [1–3]. Similarly, the prevalence of MD in the general population, including young and old adults, is reported to be three to 5 % in Western Europe and Northern America . Contrasting the stable prevalence of MD over time, the proportion of MD among psychiatric inpatients increases seven fold from below 30 years of age to age 70 and approaches 40% . Consequently, departments of geriatric psychiatry in Norway dispose about one bed per 1000 aged 65 years and above, and non-responders to psychotherapy and anti-depressive medication treated in the primary health care are referred . Thus, a better understanding of mechanisms involved in treatment resistant MD in old age may contribute to improve the quality of life and reduce the health care costs. As inflammation is associated with treatment resistance in younger adult patients with MD , exploring immune markers in old psychiatric inpatients with MD may contribute to expand the understanding of mechanisms that are involved. The association between inflammation and MD in old psychiatric inpatients is sparsely examined. One study reported a 171% higher mean plasma level of interleukin (IL)-1β in 19 old inpatients compared to 21 non-depressed old controls . In contrast, another study reported equal plasma concentration of IL-1β, IL-6 and tumour necrosis factor (TNF) between ten old MD psychiatric inpatients and ten non-depressed nursing home residents . Additionally, several population-based, cross-sectional studies support an association between IL-6 and MD in old people [10–13] but the difference in plasma level of IL-6 between the non-depressed and those with depressed mood seems modest . Accordingly, a meta-analysis including mainly young adults found a medium effect size relationship between MD and the markers IL-1 and IL-6, but suggested a dose-response relationship between MD and inflammation . Ageing is associated with increased inflammation  and together with age related cerebral hypo-perfusion inflammation is hypothesized to be involved in development of depression in old adults . Accordingly, serotonin receptor 2B (Htr2b) is reported to be upregulated during ageing in rodents  and Htr2b is reported to be co-localized with astrocytes and activated phagocytic microglia in peri-infarcted brain areas in humans . The Astrocyte is the crucial microglia in the homeostasis of the human brain  and activated human astrocytes release cytokines initiating monocyte transmigration . Thus, a connection between inflammation, microglia and mood regulation is suggested  and an understanding of these mechanisms may reveal useful biomarkers and new targets in treatment of MD in the old . In our study, we decided to explore the plasma concentrations of 27 immune markers in old psychiatric inpatients with unipolar MD, because the association between inflammation and MD is sparsely investigated in old inpatients. 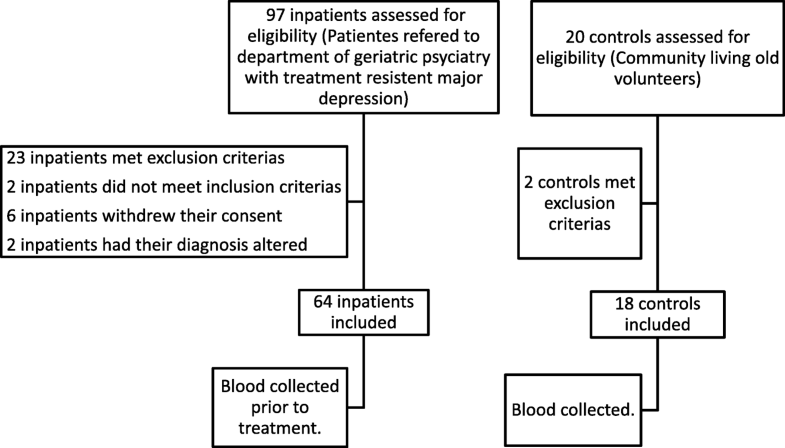 In this study, we aimed to explore the plasma concentrations of 27 immune markers in old psychiatric inpatients with unipolar MD resistant to antidepressant treatment compared to a group of non-depressed old persons. Next, we aimed to ascertain whether a selection of plasma immune markers simultaneously might classify the depressed patients and the non-depressed controls. Finally, we aimed to explore the association between immune markers and the severity of symptoms characterizing MD in old persons. The current study is a pre-electroconvulsive treatment, exploratory study comparing old psychiatric inpatients diagnosed with unipolar MD to a non-depressed control group of old persons. The study includes a subgroup of the patients from a larger randomized controlled trial , registered with the identifier: NCT01559324 at the online clinical database ClinicalTrials.gov. To be included, the patients were required to fulfil the criteria of the Diagnostic and Statistical Manual of Mental Disorders, Text Revision (DSM IV-TR)  of having a current episode of unipolar MD and having a score of at least 18 on the 17-item Hamilton Rating Scale for Depression (HRSD)-17 [23, 24]. The patient had to be between 60 to 85 years of age and had to be competent to give informed consent. All the patients were referred for electroconvulsive therapy (ECT). The following were exclusion criteria; bipolar depressive disorder, Parkinson’s disease, schizophrenia, schizoaffective disorder, alcohol or substance abuse during the last three weeks, Mini Mental State Examination (MMSE) [25, 26] score of < 24 or having a diagnosis of dementia. Patients with medical conditions contradicting ECT, including all acute medical conditions and life threatening medical conditions including an advanced stage of cancer, were excluded. Likewise, patients having received ECT within the previous six months were excluded. We recruited Norwegian-speaking patients at the Diakonhjemmet Hospital, Department of Geriatric Psychiatry, a public hospital of Oslo, Norway. The department serves approximately 28,000 inhabitants aged 65 years and older. The patients were recruited during the period 1 September 2009 to 1 May 2013. Figure 1 depicts the flowchart of the recruitment process for the patients and controls. Ninety-seven patients were assessed for eligibility and 64 patients were included in the trial. Among the 33 excluded patients, 23 met exclusion criteria; two did not meet inclusion criteria; six withdrew their consent and two had their diagnosis altered. Unipolar MD was diagnosed according to the DSM-IV-TR criteria . 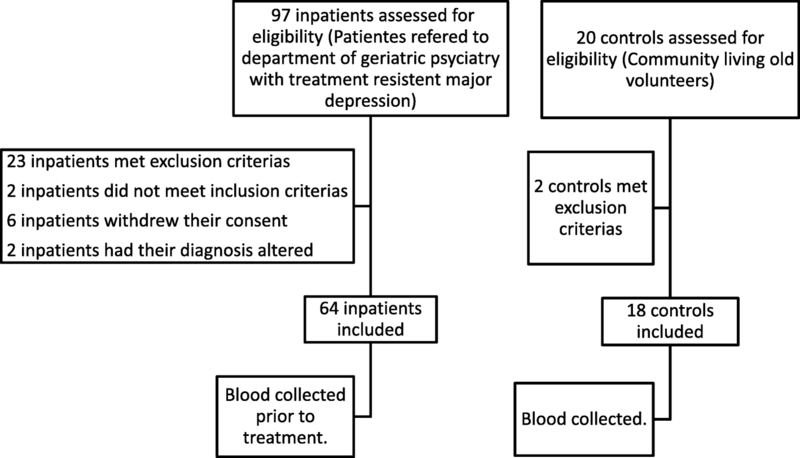 Screening for psychiatric co-morbidity was performed by a consensus between two independent senior consultants in geriatric psychiatry after a standardized clinical interview including the diagnostic structural tool Mini-international Neuropsychiatric Interview (specifically the MINI-Plus) [27, 28]. The HRSD-17 was used to rate the severity of the symptoms characterizing MD. All included patients underwent a routine physical examination with special attention to the cardiac-, respiratory- and nervous systems as a preparation for anaesthesia. The physical examination also included assessment for body mass index (BMI), blood sedimentation reaction (SR), C-reactive protein (CRP), leukocytes, haemoglobin, electrolytes, creatinine, liver-enzymes, thyroxine, HbA1c and glucose. Present and previous physical diseases affecting the immune system activity (e.g., cancer, inflammatory diseases and infections) were registered. We measured the cumulative medical burden of physical diseases using the Cumulative Illness Rating Scale for Geriatric Patients (CIRS-G)  (Table 1). One item regarding psychiatric disorders was excluded from the CIRS-G. The use of prescribed drugs was registered. We recruited 20 non-depressed Norwegian speaking old adults from a community senior citizens centre as a control group (Table 1). Two of the controls were excluded because they had an advanced stage of cancer. This exclusion criterion also applied to the patient group. Symptoms of depression were assessed by the HRSD-17 (Table 1). We measured the cumulative medical burden of physical diseases using the CIRS-G (Table 1) from which the psychiatric item was excluded. Apart from assessing BMI, we did not perform physical examinations, and we did not register the use of psychotropic drugs in the controls. EDTA-plasma in peripheral blood was collected between 08.00 and 10.00 a. m. from the patients and between 10.00 and 11.00 a. m. from the controls. The blood was collected from patients before interventions with ECT. The blood was immediately centrifuged at 4 °C at 3000 x g for 15 min and immediately stored in a local bio-bank at − 80 °C. The plasma samples were analysed (in a hospital laboratory in Bodø, Norway) using a multiplex cytokine assay (Bio-Plex Human Cytokine 27-Plex Panel; Bio-Rad Laboratories Inc., Hercules, CA, USA) containing the following immune markers: IL-1β, IL-1 receptor antagonist (ra), IL-2, IL-4, IL-5, IL-6, IL-7, IL-8, IL-9, IL-10, IL-12 (p70), IL-13, IL-15, IL-17, eotaxin, basic fibroblast growth factor (bFGF), granulocyte-colony stimulating factor (G-CSF), granulocyte macrophage colony stimulating factor (GM-CSF), interferon (IFN)-γ, interferon-inducible protein (IP)-10, monocyte chemotactic protein (MCP)-1, macrophage inflammatory protein (MIP)-1α, MIP-1β, platelet derived growth factor (PDGF)-BB, regulated upon activation T cell expressed and secreted (RANTES), tumour necrosis factor (TNF)-α and vascular endothelial growth factor (VEGF) (Table 3). The samples were analysed on a Multiplex Analyzer (Bio-Rad Laboratories) according to instructions from the manufacturer. The lower detection limit was in the range of 0.24–18.84 pg/ml for the different immune markers. Values measured below the lower detection limit were extrapolated beyond standard range and values out of range were given the value 0.001 pg/ml in the statistical analysis. We classified the immune markers in the categories; pro- and anti-inflammatory, adaptive  and trophic based on their main signalling (Table 2). a The concentration values were extrapolated beyond standard range in 49 cases. b The concentration values were extrapolated beyond standard range in 50 cases. c The concentration values were extrapolated beyond standard range in 23 cases and the concentration values were out of range in 35 cases. d The concentration values were extrapolated beyond standard range in three cases and the concentration value were out of range in 22 cases. e The concentration values were out of range or extrapolated beyond standard range in more than 20% of the cases. f Independent samples median test. The demographic and clinical characteristics were presented as group means and standard deviations (SDs) or frequencies and percentages. We compared group characteristics of patients and controls, as well as patients with and without physical diseases affecting the immune system activity, using independent samples t-test and χ2-test. The immune markers were non-normally distributed, and therefore we described them using medians and first and third quartiles. We conducted group comparisons between the patients with and without physical diseases affecting the immune system activity as well as between the patients and the controls using the independent samples median test. As the distribution of most immune markers was highly skewed, we used the LN-transformed values in all further analysis. We assessed correlations among immune markers using Pearson’s correlation coefficients. Receiver operating characteristic (ROC) curve analysis was performed on 27 immune markers to assess their ability to classify depressed patients and non-depressed controls. We selected the immune markers with an area under the ROC curve (AUC) of at least 0.85 and a specificity of at least 0.85 for a stepwise discriminant analysis (DA), as we aimed at defining a selection of a few factors that could simultaneously classify depressed patients and non-depressed controls. We adopted a cut-off of 0.85 to ensure that only immune markers with good classification ability would be included in the DA. The immune markers chosen by a stepwise DA were further explored in bivariate and multivariate linear regression models for a continuous HRSD-17 score. We entered the interaction terms between each immune marker and the variable identifying patients and controls into the regression model. A significant interaction implies that the immune marker is associated to the HRSD-17 score differently among the depressed patients and the non-depressed controls. All non-significant interactions were excluded. Finally, we adjusted the multivariate regression model for gender, age, CIRS-G scores and BMI. The IBM SPSS Statistics 22 software and STATA v.12 were used for statistical analyses. All tests were two-sided, and we deemed the results with p-values below 0.05 to be statistically significant. We found higher concentrations of 22 immune markers (IL-1β, IL-1ra, IL-2, IL-5, IL-6, IL-7, IL-8, IL-9, IL-12, IL-13, IL-15, IL-17, eotaxin, bFGF, G-CSF, GM-CSF, MCP-1, MIP-1β, PDGF-BB, RANTES, TNF and VEGF) and lower concentration of IP-10 in the patients compared to the controls (Table 2). On the other hand, the concentrations of IL-4, IL-10, IFN-γ and MIP-1α were not significantly different between the two groups (Table 2). Only four immune markers (IL-1β, IL-5, IL-10 and IL-15) had concentrations below the lower detection limit in a considerable portion (77, 78, 91 and 39% respectively) of the patient cases. The remaining 23 immune markers had concentrations above the lover detection limits in 81–100% of the patient cases. In contrast, 18 immune markers (IL-1β, IL-1ra, IL-2, IL-5, IL-6, IL-7, IL-9, IL-10, IL-12, IL-13, IL-15, IL-17, bFGF, G-CSF, MIP-1α, PDGF-BB, TNF and VEGF) had concentrations below the lower detection limit in more than 20% of the cases in the controls (Table 2). Gender, age, physical health, BMI, cognition and education were not significantly different between the groups (Table 1). Within the patient group, 37 patients with reported physical diseases affecting the immune activity had worse but not significantly different (p = 0.074) physical health as measured with CIRS_G (mean CIRS-G = 7.5) compared to 27 patients without reported physical diseases affecting the immune system activity (mean CIRS-G = 5.9) (Additional file 1: Table S1). Of the 27 assessed immune markers, only the plasma concentration of IL-5, IL-8 and VEGF were significantly higher in the patients with reported physical diseases affecting the immune system activity (p = 0.015, 0.020 and 0.016, respectively) compared to the patients without physical diseases affecting the immune system activity. Because of the similarity in concentration of immune markers between these two groups of patients, we treated the patients as one group. According to the ROC curve analyses (Table 3), nine markers (IL-1β, IL-1ra, IL-7, IL-8, IL-17, GM-CSF, MCP-1, TNF and VEGF) discriminated well between the patients and the controls as defined by the area under the ROC curve (AUC) of at least 0.85, and with a specificity of at least 0.85. The concentrations of all immune markers correlated on a range of weakly to strongly (data not shown). A step-wise discriminant analysis on the nine immune markers identified by ROC analysis suggested that the five markers, VEGF, IL-7, MCP-1, TNF and IL-1β (Fig. 2) are sufficient to classify the patients and the controls without loss of discriminatory power. The five markers correctly classify 98.4% of the patients and 83.3% of the controls, implying a correct classification rate of 95.1%. No significant interactions were found in bivariate linear regression models, implying that there are no differences between the patients and the controls regarding the positive association between the HRSD-17 score and each of the five immune markers. In the multivariate linear regression model IL-7, TNF and VEGF were significantly associated with the HRSD-17 score. After adjusting for age, gender, CIRS-G and BMI; only TNF and VEGF remained significantly associated with the HRSD-17 score (Table 4). This model explained 53.3% of the total variance of the HRSD-17 score. Our finding showing a higher concentration of a variety of immune markers representing pro- and anti-inflammatory, adaptive and trophic signalling indicates that several immune mechanisms may be involved in MD in old psychiatric inpatients. Additionally, our results indicate that the immune system may be highly activated in old psychiatric inpatients with MD, and this is consistent with a meta-analysis suggesting a dose-response relationship between inflammation and MD . Further, the meta-analysis based mainly on adult outpatients reported medium effect size in the relationship between inflammation and MD . The explorative approach of our study with a study population capable of detecting only large effect sizes between inflammation and MD, excluded reliable hypothesis testing. Therefore, identifying a more precise effect size in the relationship between inflammation and MD in old psychiatric inpatients requires further studies. However, our sample of old depressed inpatients is still the largest one in which study focused on the relationship between inflammation and MD. Thus, our study may contribute to better power calculations in the planning of future studies and testing of our hypothesis. We found low plasma concentrations of IL-1β, IL-5, IL-10 and IL-15 in the patients and the controls, which is a finding in line with a previous study reporting low serum concentration of IL-10 in adult depressed out-patients and non-depressed controls . The low concentrations make our comparisons of these four immune markers between the two groups less reliable; further exploration of these markers in old psychiatric inpatients with MD may require more sensitive laboratory methods than the multiplex analyses . Furthermore, 14 immune markers had plasma concentrations below the lower detection limit in more than 20% of the cases in the controls. However, values out of range were given the value 0.001 pg/ml and the concentrations were compared using medians to limit the risk of overestimating the differences between the groups. The trophic cytokines bFGF, G-CSF, GM-CSF and VEGF were higher in the patients compared to the controls. That is the opposite of what may be expected, as the more widely studied brain derived neurotrophic factor (BDNF) seems to be lower in untreated patients with MD compared to healthy controls . On the other hand, higher level of VEGF in the patients with MD compared to the controls is a finding consistent with reports in previous studies . Finally, pro-inflammatory cytokines like IL-1, TNF and INF-γ may induce GM-CSF, and could at least explain the high concentration of GM-CSF . Applying step-wise DA on a large number of immune markers implies some risk of detecting false effects and failing to select the best subset of markers able to describe differences between the two groups. To reduce the latter problem, we performed ROC curve analysis prior to DA to identify the most promising markers that could separate the patients from the controls. Our explorative statistical analyses elucidating immune markers that may classify old persons correctly into the depressed and the non-depressed group suggested that only five markers (VEGF, IL-7, MCP-1, TNF and IL-1β) simultaneously classified about 95% of the persons correctly. To our knowledge, this has not been reported previously. However, the analyses imply a risk for Type 1 error and were not based on prior knowledge about the immune markers’ ability to separate depressed patients from non-depressed controls. Therefore, the ability of these five immune markers to separate depressed from non-depressed should be replicated in a new population. We found a significant association between the severity of depression rated by the HRSD-17 and the levels of the three immune markers VEGF, IL-7, and TNF in the multivariate regression model. After adjusting the associations for age, gender and CIRS, only VEGF and TNF remained significantly associated to the HRSD-17 score. In contrast to the bivariate linear regression model, the multivariate regression model suggested a negative association between TNF and HRSD-17 (Table 4), which is likely due to over-adjustment in the model caused by strong correlations among the immune markers (Additional file 2: Table S2). Our finding deviates from that of Thomas et al. who found a correlation between the level of IL-1β and the severity of the depression in old persons. Additionally, our finding contrasts with the results of Brambilla et al. , who found no correlation at all between the severity of the depression and the levels of inflammatory cytokines in old persons. However, Brambilla et al. included only ten old patients with MD and consequently may not have had enough statistical power to detect putative group differences. A small number of patients in this and previous studies, as well as differences in the study populations, may have contributed to the conflicting results. Limited inclusion and exclusion criteria were defined for the controls in our study and did not ensure an optimal match of patients and controls. However, the groups did not differ significantly regarding gender, age, physical health, BMI, cognition and education, and this indicates an acceptable match between the groups. Still, we do not know if the groups differed in health behaviours, personality and emotional loneliness (Additional file 3: Table S3). Nevertheless, according to Mottus et al. health behaviours such as smoking, alcohol intake and physical activity did not significantly affect inflammation in old. However, personality had a minor impact on inflammation in old persons . Likewise, loneliness seems to have limited impact on inflammation in adults . Thus, potential differences in health behaviour, personality and emotional loneliness between the patients and the controls in our study may potentially alter our results to a slight extent. The controls were not examined in the same way as the patients. Physical diseases were assessed by self-reporting only; medication was not assessed, and MD was excluded by using the HRSD-17, not by a psychiatric interview. Consequently, we may have missed pro-inflammatory medical conditions and we may have included controls with MD in remission with ongoing anti-depressive medication leading to an underestimation of the differences between the groups. However, because physical diseases such as heart disease and cancer seem to have a small impact on the levels of immune markers [38–42] compared to MD, a possible underestimation of the difference between the groups is probably small. This is also in line with our results where only three of 27 immune markers had significantly higher concentrations in patients with physical diseases affecting the immune system activity compared to the patients without. Likewise, if we accidentally included MD outpatients in remission and groups such as controls, this would probably not have altered our results because the levels of cytokines seem to be equal between outpatients treated with anti-depressive medication and healthy controls . Our patient group represents old MD psychiatric inpatients that have not responded to medication and psychotherapy as outpatients, therefore our results should not be projected to younger adults or outpatients. The explorative cross-sectional design of this study excludes reliable testing of hypotheses and determination of the temporality in the associations demonstrated between immune markers and symptoms characterizing MD. Additionally, exploring a wide range of immune markers increases the risk of identifying false effects (Type I error) and the limited number of participants implies that only large effects sizes may be demonstrated (Type II error). Further, the accuracy of the data may be affected by the self-reporting nature of data sampling in the control group. Lastly, the plasma concentrations of several immune markers in the control group were below the lower-detection level, which may also influence the accuracy of comparison between the patient group and the controls. Gro Strømnes Dybedal PsyD, PhD has been an important motivator in discussions involving interpretation of the data, and she conducted a major part of the assessments of the symptom severity. We thank Judith Krey Ludviksen for excellent technical performance of the cytokine analyses. The collection of data in this study was sponsored by the Department of Geriatric Psychiatry, Diakonhjemmet Hospital. All laboratory analyses were sponsored and done at the Research Laboratory, Nordland Hospital Bodø and K.G. Jebsen TREC, University of Tromsø. The article was written with a PhD grant, project number 2014113, from the South-Eastern Norway Regional Health Authority. The Department of Geriatric Psychiatry and the Research Laboratory have together designed the study; they have both been involved in the interpretation of the data and in writing of the manuscript. The Department of Geriatric Psychiatry did collect all the data whereas the Research Laboratory did all the laboratory analysis. The PhD grant from the South-Eastern Norway Regional Health Authority was given when all the data was collected and analysed. The South-Eastern Norway Regional Health Authority has not contributed in study design, data collection, data interpretation or writing the manuscript. Diakonhjemmet hospital, Department of Geriatric Psychiatry. Pastor Fangens vei 18, 0854 Oslo, Norway. TLG participated in recruiting patients and was a major contributor in writing the manuscript. KE participated in the planning of the study and was a major contributor in writing the manuscript. TMB participated in planning the study and recruiting patients and was a contributor in writing the manuscript. JŠB performed the statistical analyses and contributed in writing the manuscript. ML participated in recruiting patients and was a contributor in writing the manuscript. BL participated in the planning of the study and was a contributor in writing the manuscript. TEM participated in the planning of the study, interpretation of the data and was a contributor in writing the manuscript. AC participated in the planning of the study and was a major contributor in writing the manuscript. All authors have read and approved the final manuscript. The Regional South East Committee for Medical and Health Research Ethics in Norway has approved the study. Inclusions have been based strictly upon informed consent and the patient’s signature.